Attorney General Eric Holder has an urgent message for Americans: While he is confident that the United States will continue to thwart attacks, "the terrorists only have to be successful once." And while it is not certain we will be hit, the American people, he told ABC News, "have to be prepared for potentially bad news." "What I am trying to do in this interview is to make people aware of the fact that the threat is real, the threat is different, the threat is constant," he said. In a rare and wide-ranging interview, the attorney general disclosed chilling, new details about the evolving threat of homegrown terror, and touched on topics ranging from Wikileaks to the prisoners at Guantanamo Bay. What was uppermost on his mind, however, is the alarming rise in the number of Americans who are more than willing to attack and kill their fellow citizens. "It is one of the things that keeps me up at night," Holder said. "You didn't worry about this even two years ago -- about individuals, about Americans, to the extent that we now do. And -- that is of -- of great concern." "The threat has changed from simply worrying about foreigners coming here, to worrying about people in the United States, American citizens -- raised here, born here, and who for whatever reason, have decided that they are going to become radicalized and take up arms against the nation in which they were born," he said. In the last 24 months, Holder said, 126 people have been indicted on terrorist-related charges, Fifty of those people are American citizens. "I think that what is most alarming to me is the totality of what we see, the attorney general said. "Whether it is an attempt to bomb the New York City subway system, an attempt to bring down an airplane over Detroit, an attempt to set off a bomb in Times Square ... I think that gives us a sense of the breadth of the challenges that we face, and the kinds of things that our enemy is trying to do." Holder says many of these converts to al Qaeda have something in common: a link to radical cleric Anwar Al Awlaki, an American citizen himself. Authorities suspect Awlaki helped mastermind last year's Christmas Day underwear bombing plot in Detroit, and a recent scheme to blow up cargo planes travelling from Yemen to Europe and the United States. "He's an extremely dangerous man. He has shown a desire to harm the United States, a desire to strike the homeland of the United States," Holder said. "He is a person who -- as an American citizen -- is familiar with this country and he brings a dimension, because of that American familiarity, that others do not." Holder said that as a threat to the United States, Awlaki ranks right up there with Osama bin Laden. "He would be on the same list with bin Laden," the attorney general said. "He's up there. I don't know whether he's one, two, three, four -- I don't know. But he's certainly on the list of the people who worry me the most." When asked whether the United states has a preference between killing or capturing and prosecuting Awlaki, Holder replied: "Well, we certainly want to neutralize him. And we will do whatever we can in order to do that." Awlaki is believed to be in Yemen, but thanks to the Internet, his reach is global, and his influence dangerous. Authorities say his teachings and writings have been discovered on the computers of a number of radicals who have tried to carry out terror plots here in America. Holder said Awlaki is able to preach violence on al Qaeda websites, and reach new converts. "The ability to go into your basement, turn on your computer, find a site that has this kind of hatred spewed ... they have an ability to take somebody who is perhaps just interested, perhaps just on the edge, and take them over to the other side," he said. To combat the threat of Americans turning to al Qaeda and violence, the United States is monitoring scores of radicals and has set up stings to blunt the threat. The increasing number of FBI stings, such as the alleged plot to detonate a bomb at a Christmas tree lighting in Portland, are not without controversy, but Holder vigorously defended them. "Options are always given all along the way for them to say, 'You know what, I have changed my mind. I don't want to do it.' Everyone that we have charged has said, 'No I want to go forward,'" he said. "All those actions were designed to kill Americans. "I have to have all those tools available to me to try to keep the American people safe, and to do the job that I'm supposed to do as a 21st century attorney general," Holder said. Holder said the United States has made great strides in improving its ability to detect and block attacks, which is shown by the number of would-be terrorists who have been stopped before they could kill Americans. The intelligence community is working around the clock, he said, with little time off. 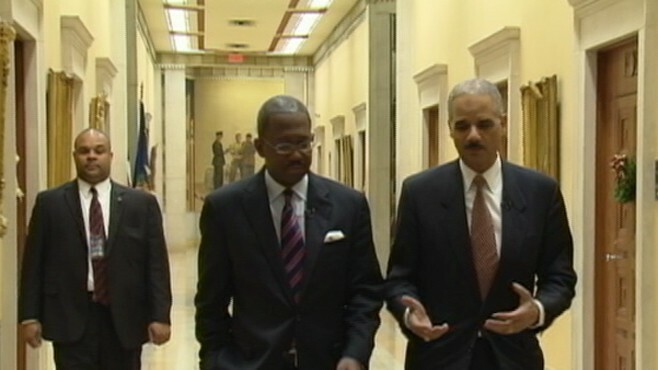 "We are doing everything that we possibly can to keep the American people safe," Holder said. "We are vigilant, we are doing everything we can to keep our homeland secure,"
Turning to how terror suspects are tried, Holder said he still believes the "decision as to how people get prosecuted, where they get prosecuted, is an executive branch function. Even if those suspects are being held now at Guantanamo Bay. Holder said Congress should not be interfering with that. "It's -- from my perspective -- a constitutional issue," he said. As for Julian Assange and Wikileaks, Holder said "it's an ongoing investigation." "What Wikileaks did, at the end of the day, was harmful to American security, put American agents and properties ... at risk ... and I think for arrogant and misguided reasons," he said.